As the sole breadwinner of the family, Mr Soh Yew Hoe, 41, works as a cleaning attendant at Resorts World Sentosa to support his family of 4. His daughter, Charmaine, 13, has been a beneficiary of the ST Fund since 2009. Life has not been easy for the Soh family, who lives in a 3-room flat. The family gets by with Mr Soh’s meagre income of $1,600 per month ($400 gross per capita household income). On top of that, the family has to spend around $120 on their younger son, Soh Zheng Da’s medication. Zheng Da, 12, is a student at MINDS Woodlands Gardens School, a special education school for the intellectually disabled. He suffered from high fever due to the side effect of vaccination at a young age, and doctors revealed that his intellectual development would be delayed. As such, Mrs Soh spends her time taking care of her son when he is not in school and is unable to seek employment. “STSPMF has helped to lighten my burden greatly by supporting my children’s transportation costs,” said Mr Soh. 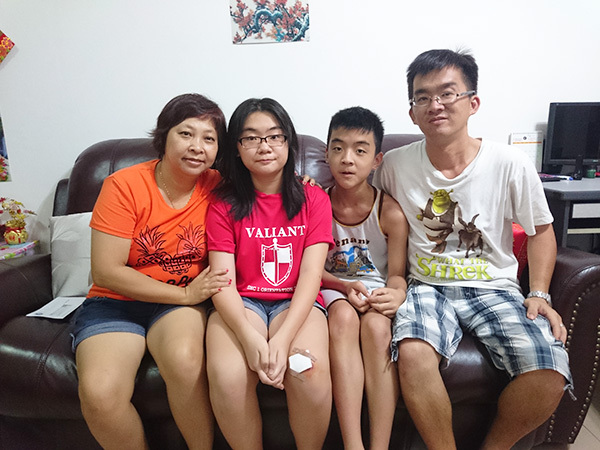 Charmaine did well in her PSLE, scoring 2As and 1A* in the PSLE National Examination in 2014 and was one of the award recipients at the STSPMF Academic Award Ceremony. Two years ago, he was a rebellious pre-teen who loitered on the streets with his friends until late into the night. 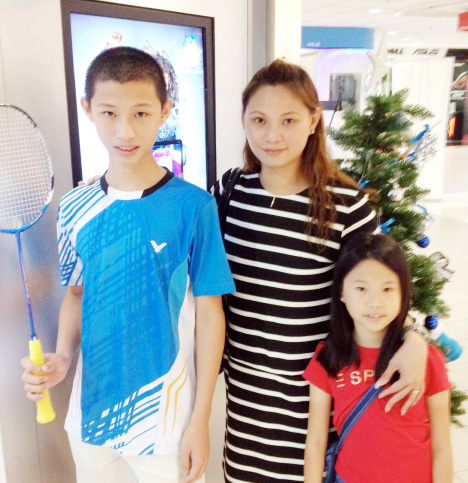 Today, Nicholas Tan, 14, is one of the top students in his class at Ang Mo Kio Secondary School, and spends his free time playing badminton, a sport that he loves. Nicholas, who comes from a low-income family, is a beneficiary of The Straits Times School Pocket Money Fund (STSPMF). The $95 a month he receives helps to cover many of his school-related expenses. Nicholas’ 34-year-old mother suffers from a bad right knee, which makes it painful for her to walk and prevents her from working. His father, 38, works as a casket bearer, and brings home about $1,000 a month. His salary is hardly enough for the family of five, which includes Nicholas’ two sisters, aged eight and 17. Mdm Qhameira Ani Binti Ismail, aged 33, is a single mother with 3 school-going children, aged 12, 7 and 6. The family lives in a 3 room HDB flat. Mdm Qhameira Ani takes care of her children single-handedly. She approached Thye Hua Kwan FSC at Bedok North in June 2012 for financial assistance and advice. Mdm Qhameira Ani was initially reluctant to trust the social worker. After a year of relentless engagement, the social worker was able to gain the trust of Mdm Qhameira Ani. The Straits Times School Pocket Money Fund (STSPMF) was used as a tool to further engage Mdm Qhameira Ani for intervention by the social worker. As part of her intervention, Mdm Qhameira Ani worked hard to get her home based bakery business back on track. Mdm Qhameira Ani also took up the social worker’s suggestion of clearing up her common room for rental. She now gets $450 monthly from the rental of her room since April 2014. As a result of these effort, Mdm Qhameira Ani’s financial situation improved and she was able to balance her income and expenditure for the household. The Fund has helped Mdm Qhameira Ani to ensure that her children have enough pocket money to go to school and to attend school regularly. Her children’s attendance has been regular and they appear well adjusted. 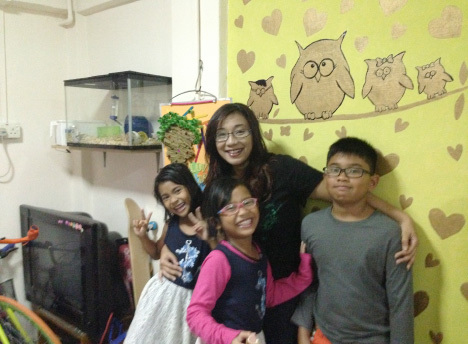 In view of Mdm Qhameira Ani’s positive progress, the social worker had invited Mdm Qhameira Ani to join Thye Hua Kwan FSC at Bedok North’s Project Love in Oct 2014 as a mentor family. In Project Love, Mdm Qhameira Ani taught fellow families baking skills, and acted as a mentor to motivate fellow families. This has helped her rebuild her self-esteem and confidence, and has motivated her to strive further. The children are also proud of their mother’s turn around and the parent-child relationship had improved tremendously.